Ever since the devastating tsunami and earthquake damaged the nuclear plants in Japan about a month ago, news about the possibility of some foods being contaminated with radioactive substances has grown. Shipment of milk, spinach, broccoli and similar vegetables have reduced or been banned. The risks of cancer and other health problems are increased if highly radioactive foods are consumed, because high exposure can damage the body's DNA . During radiation therapy (used to treat cancer), targeted cancer cells are destroyed with high radiation exposure. However, no harm has thus far been seen in consuming irradiated foods or microwaved foods, although safety concerns have been raised by some groups of people. Foods are irradiated to destroy bacteria, viruses or insects, and to increase the shelf-life. Irradiated foods carry a symbol (shown here). Microwaving is used for convenience and to cook foods quickly. Very small amounts of natural radioactivity is said to be present in some foods. Natural radioactivity is picked up by crops either through soil or water. Similarly, fish and shellfish can pick up natural radioactivity from the sea-bed or water. 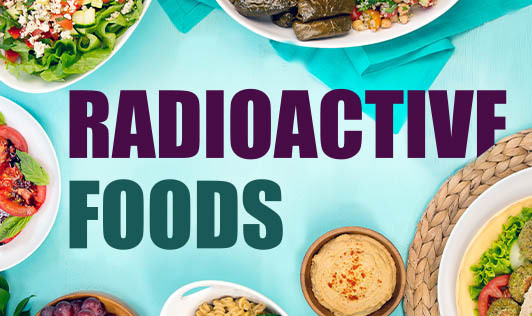 The bottomline (as of now) is that foods that contain low amounts of radioactivity are not harmful to health but those with high amounts can destroy cells.